Thursday 30th April 2015 – They’re starting to grow. Now I’ve not been down the allotment much this week, either because I’ve been working, or the weather has been pants. But today was sunny and I was free so off I went to see what had been going on. I was very please to see that my Parsnips, Carrots and Beetroot are growing. They’ve just started to pop through the soil, so I’ll keep talking to them and hopefully they’ll grow fast. I didn’t need to water today, as yesterday it poured all morning and I got caught out in it and got very wet (I was not impressed). The water has gone down in the soil a fair way so that’s good. I also finished digging over the large bed where the Pumpkins grow last year. The soil is very good in that bed and easy to weed. Must be because of all the manure that I put in the soil to help the Pumpkins. It worked as I got 25 last year!! Last years Pumpkin bed. All clear now. What to plant in here this year! 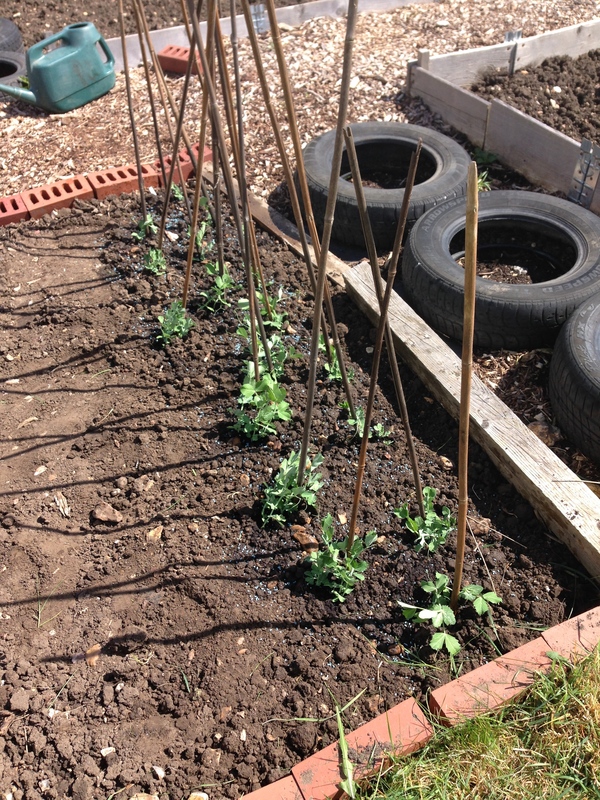 Once that was done, I then planted out my “Sugar Snap” Peas. They’ve been growing in the greenhouse for the last couple of months and now they’re ready for the big wide world. They need sticks to grow up, but I just put them in the soil higgle de piggle de, and that works. You can be more precise with your sticks if you like and make a wigwam or a long structure. Once they were all in I watered them well and then put some slug and snail protection round them. If I didn’t the slugs and snails would have a feast tonight. Don’t plant all your Sugar Snap seeds together otherwise you’ll have more than you can eat. I’ll start some more off soon, then we can have a continuous supply throughout the summer. They don’t freeze at all. First lot of Sugar Snap Peas are in. Protect well. Then after a spot of lunch it was then onto another bed where the Brussels Sprouts grew last year. 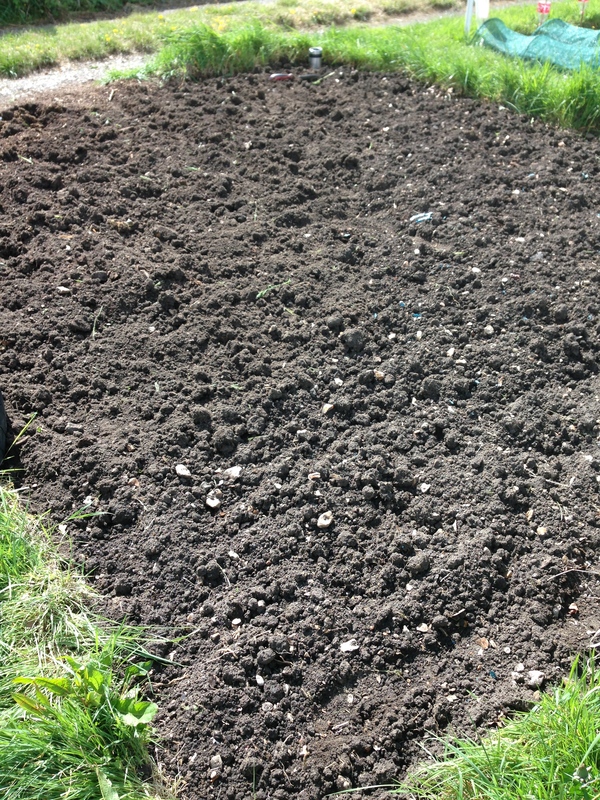 The soil is very hard in this bed, so is quite tough to dig though. But I’m getting there. I managed about two thirds of the bed before I’d had enough and came home. I think that’s enough for today. Hopefully more tomorrow, but Mark has the car, so I’ll have to walk. Still it’s not far, but just means I can’t take my strimmer with me. I don’t think walking through the park carrying a petrol strimmer is a good idea. This entry was posted in Uncategorized and tagged beetroot, brussels sprouts, carrot, claire's allotment, Mr Fothergills seeds, parsnip, peas, pumpkins, sugar snaps. Bookmark the permalink. 3 Responses to Thursday 30th April 2015 – They’re starting to grow. No, not sure I would walk through a park with a strimmer either! I’m glad that your soil got soaked by the recent rain. 25 pumpkins! A truly impressive haul. Generous helpings of manure is obviously the key to success! I’m a firm believer in manure! !